It has been 20 years since Cal Ripken Jr. became baseball’s career iron man. It is hard to believe that 20 years have passed since Cal Ripken Jr. put Major League Baseball on his back and helped it get past one of the darkest periods in its illustrious history. On September 5, 1995 Ripken matched the seemingly unbreakable record of Lou Gehrig by playing in his 2,130th consecutive game. After the game became official and the streak numbers on the B&O Warehouse turned to 2,130, he punctuated the night with a sixth inning home run. 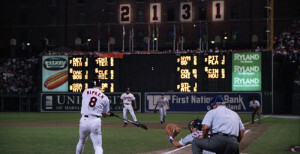 The drama was even better the following night as Ripken hit a home run in the fourth inning. Then, with Baltimore leading 3-1 midway through the fifth inning the game was halted for the dramatic unveiling of the number 2,131. 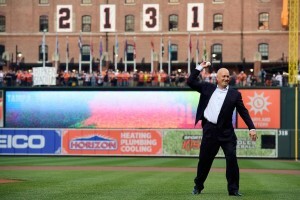 Following the unveiling, the full house at Camden Yards remained on their feet and millions of fans around the world watched as Ripken took several curtain calls and then circled the stadium in a victory lap that became a healing moment for a sport still reeling from the cancellation less than a year earlier of the World Series. The ovation and lap lasted 22 minutes and was part of the most watched baseball game since the seventh game of the 1986 World Series. While coming to work every day may not seem as glamorous as a record based more on performance, there was something about the ironman streak that resonated with baseball fans (and still does). Certainly, part of that is because of the history and heritage from Lou Gehrig, the Iron Horse. The New York Yankees first baseman played in 2,130 consecutive games between 1925 and 1939 with the streak ending only because Gehrig was diagnosed with an incurable disease that ultimately would become known as Lou Gehrig’s disease. 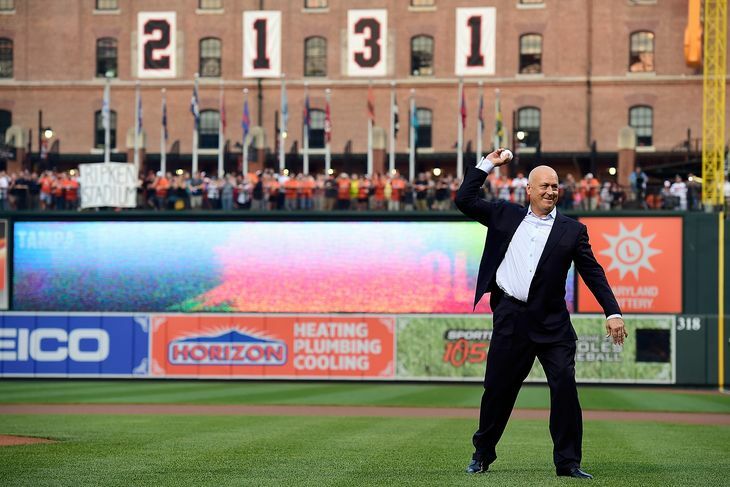 Ripken was back in Baltimore this week to mark the 20th anniversary of his record setting game. In the 56 years between the end of Gehrig’s streak and Ripken breaking the record, two other players (Billy Williams and Steve Garvey) had streaks of more than 1,000 consecutive games. Playing every day has become even rarer in the last 20 years as Miguel Tejada (who played in 1,152 straight games between 2000 and 2007) is the only player with a streak of more than 600 games since Ripken broke the record. For that reason, it seems unlikely that Ripken’s record, which he extended to 2,632 straight games before sitting late in the 1998 season, will ever be broken. Ripken remains a baseball icon and even fans too young to have ever seen him play have been introduced to baseball’s Iron Man. 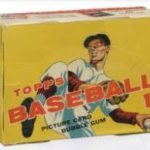 He conducts baseball clinics across the country, owns several minor league baseball teams and can be seen as a baseball commentator on TBS Sports. But, for anyone who was either in the stadium or watching on TV, Ripken’s moment in 1995 will forever be his defining moment and forever be recognized as one of the greatest moments in baseball history. Tags: Baltimore Orioles, Cal Ripken Jr.